I'm Italian, I live in Milan and I'm 60. Two years ago I retired from business so I have again the time and the opportunity to dedicate a good portion of my time to aircraft modelling. My preferred subjects are, of course, Italian aircraft preferably WW2 ones but not only. AS-30 (Dark Green2) and AS-31(Ocean Gray 2) for upper surfaces and AS-32 (Medium Sea Gray 2) underneath. If they are correct, do you know if there are equivalents in other acrilics like Gunze? Or, do you recommend anything else? I wish I had the kind of spare time that you have :-) ! 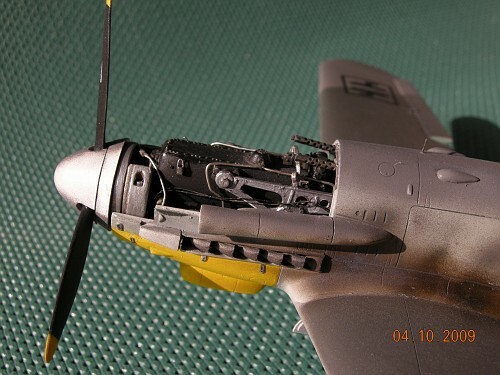 AS-30, -31 and -32 are Tamiya spray cans that were especially developed to coincide with the release of the 1/32 Spitfire. I haven't seen them used myself but I see no reason to doubt that Tamiya have done their homework well! I would be tempted to try them. They have also released three paints in their "ordinary" acrylic range corresponding to the spray cans, these are XF-81 (Dark Green), XF-82 (Ocean Grey) and XF-83 (Medium Sea Grey). I find this range of paints to be an acceptable substitute for Gunze but I haven't tried any of the XF-81, -82 and -83 even if I asked for them at the LHS today (they hadn't arrived yet). 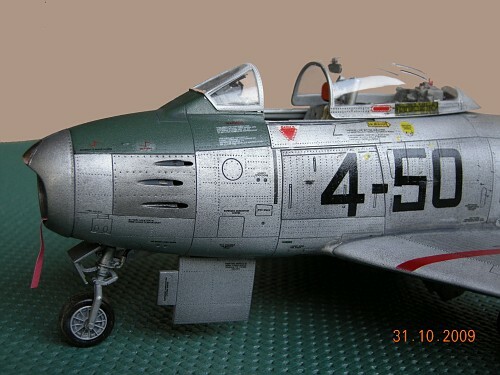 Honestly I have nothing against in using paints suggested by Tamiya but one issue I had was that, to the best of my knowledge, they were available only in spray form, difficult to use on small details ... ten you told me about the "ordinary" equivalents, exactly what I needed! A few more question, if possible. Inside this website I found a very nice presentation of the Spitfire cockpit, but it concerns the MK V and I got the feeling that some details do not apply to the Mk IX as well. 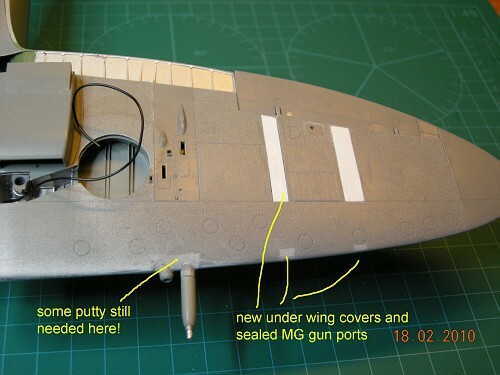 1) In the colour leaflet supplied by Tamiya I don't see the three hoses connected to the control column and pneumatically operating the guns? It's just an omission or they were covered or gun were operated differently? 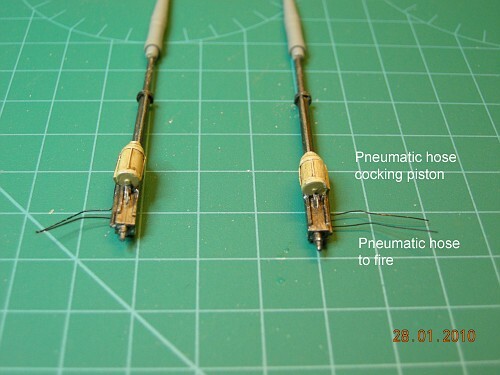 On "Modellers Datafile" I found one picture showing those hoses and an other don't. 2) Is it correct to add the oxygen hose going from the oxygen bottle to nearby pilot' seat or the oxygen mask was connected somewhere else? was it different on Mk IX or located in a different place? 4) The throttle lever colour was it yellow or white? OK, by intensive searching I found myself the answers to my questions. I post them so they can be of some interest for other people. I found this photo on page 99 of Modeller Datafile no. 3, dedicated to Merlin powered Spitfire. This book is very good, the only drawback, for me at least, is that pictures are too small for my eyes. In any case hoses are clearly there. A fellow of another forum provided me this drawing. 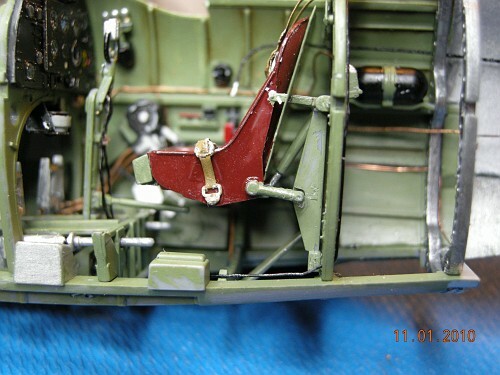 This opened my eyes and so I started searching in the right places: as you can see in the following pictures, taken respectively from IPMS Stockholm and this website, gauges and regulator were installed straight on the instrument panel. So I can go ahead and continue my work . I will post photos asap. Thanks for sharing, I am sorry I couldn't help you with this one! 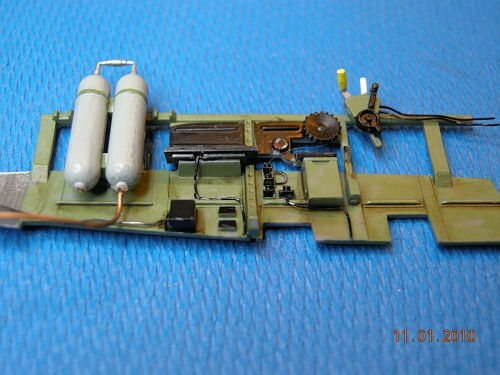 Here I'm with some photos all components are original from Tamiya kit; I just added a few copper pipes, oxygen hose and pneumatic hoses on the control stick. I hope you will like them, but I will also appreciate very much any comment that will help me improve for the next subject. 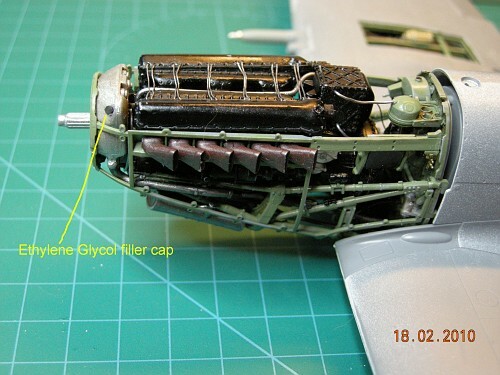 the engine in the kit is very detailed but it can be added to if you like to 'busy' it up. i used this site, and a lot of google-searching to do mine. a word of advice before you get to the stage required. DONT use the kit supplied decals though. they are not very good. the general consensus is to get aftermarket decals. (i put the wing roundels on and they cracked...). Victory Productions do a set of decals called 'Aces of the Empire' that come highly recommended. Many thanks for your comment and even more for your advice. 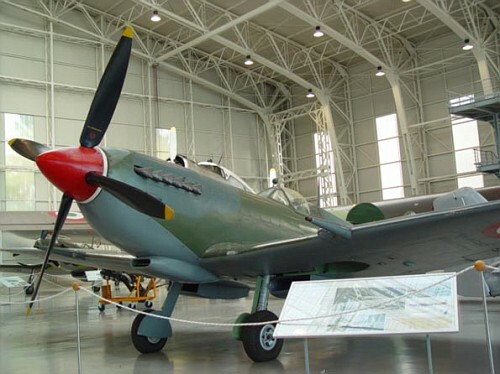 In reality my plan is to make a model concerning a Spitfire used by Italian Airforce in 1947-1950. 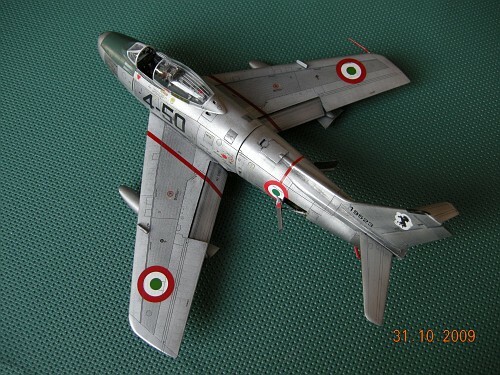 On these aircraft the Italian roundels were simply over posed to the British ones, so I need to purchase both of them! So I will do. 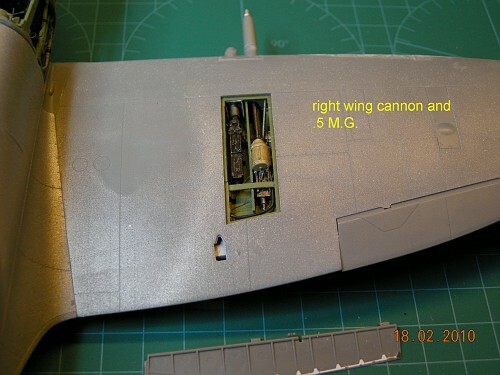 As I decided to do an aeroplane with Italian markings of past WW2 period and as most of them had "E" type wings, I prepared the gun-bays consequently and I made new covers for them. 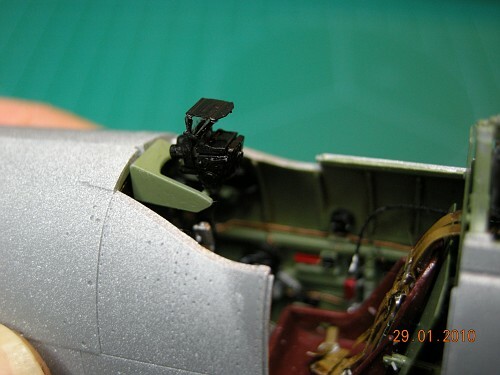 A step forward also in the assembly of the fuselage: it's eveident that the kit is very good and very little putty will be required. 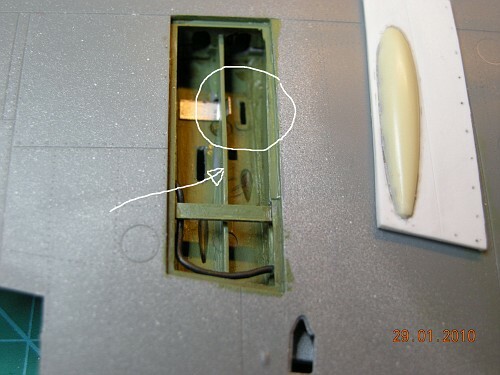 Don't forget the kit instructions to remove the aerial "post" from the rudder. VHF radios (as used in the RAF, by 1941) didn't use them. 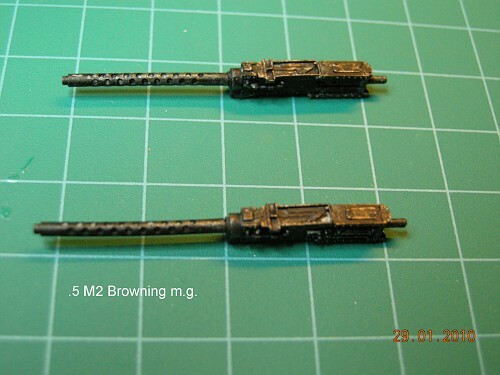 People are saying that this indicates that Tamiya plan on a Mk.I, but I'd say that they might include a Russian option in the future IXe, since the Russians used many of that Mark, and photos show them with the "old" aerials. Don't forget the kit instructions to remove the aerial "post" from the rudder. I saw the "remove" note on the instruction but I thought it was referred to the residual of sprue. 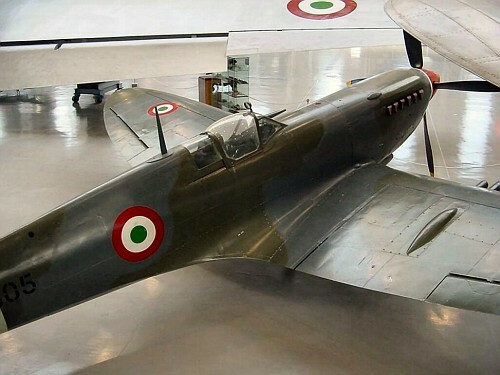 This aeroplane is the one on show at the Vigna Di Valle museum, near Rome. 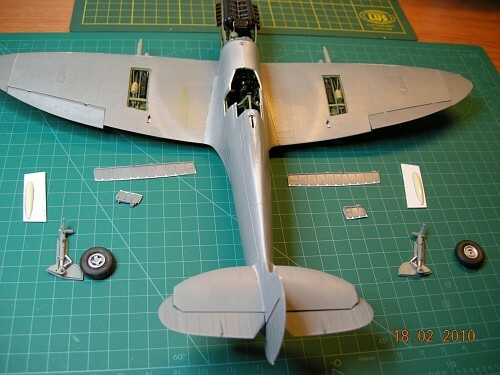 Alberto,you´re making an outstanding work on this Spitfire,the engine and weapons bay are superb,the Hispano cannon is a masterpiece.Greetings. I did very little after what's shown above, then had to stop my work because I'm almost ready for painting and, to do that, I need to wait for some good weather. In facts my airbrushing has to be done outside in the balcony, if i don't want to make my wife very, very upset.